Temporary supply constraints, e.g. supply disruption due to weather or accident at a factory. Fixed prices – and unexpected surge in demand, e.g. demand for fuel in cold winter. Government price controls, such as maximum prices. Monopoly which restricts supply to maximise profits. For example, a landlord who doesn’t rent property but prefers to avoid tax and keep property unoccupied. Embargoes or trade war – e.g. restrictions on imports of oil can lead to a shortage of petrol in that country. 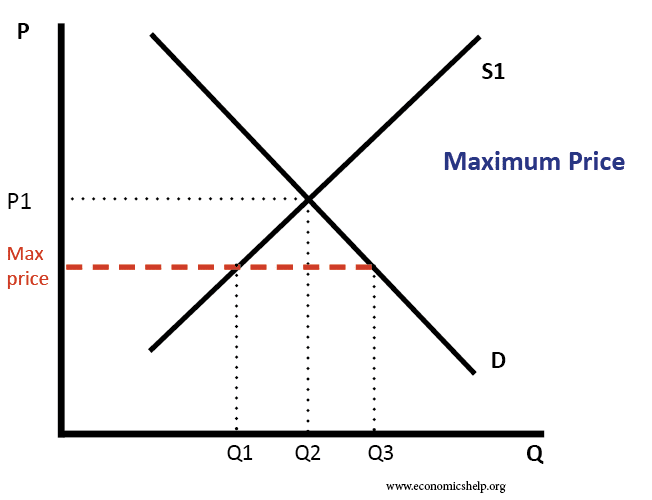 This is a government price control, where the government says the price cannot rise above “Max Price” – this leads to demand being greater than supply. The government may implement maximum prices for socially desirable goods, such as affordable housing and food. 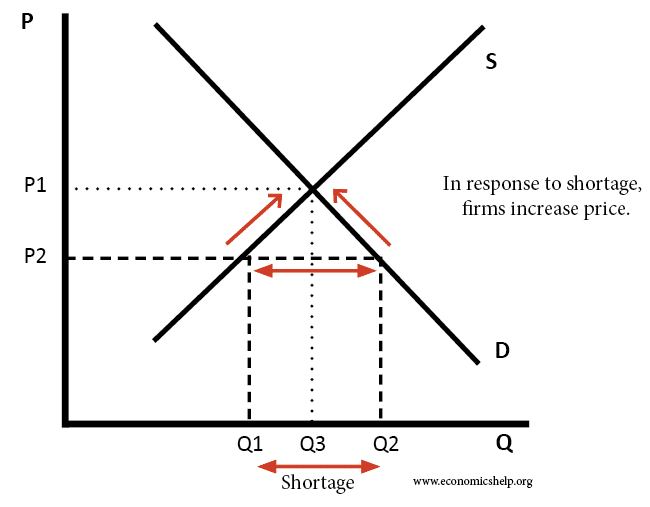 If demand and supply of housing is very inelastic, then the shortage may be quite small. 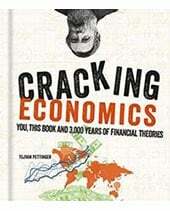 (A maximum price will not reduce supply much if supply is highly inelastic). 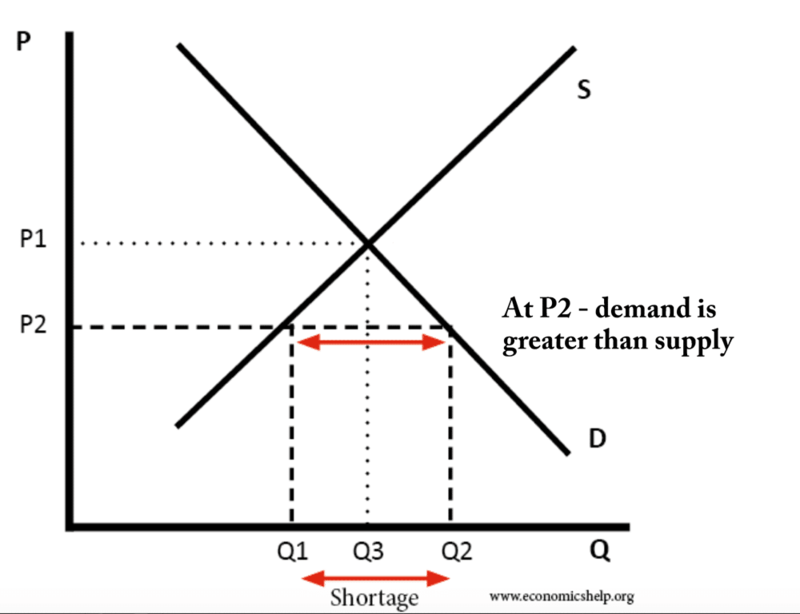 But, if demand and supply are elastic, then the shortage will be greater. A football club may set a price which is below the market equilibrium. If it set the market clearing price it may be accused of ‘profiteering’. Setting a price below the equilibrium may be important for enabling access to a wider range of the local community. At a price of £40, there are 10,000 spectators who would like to see the game, but can’t. A market solution would be to raise the price to £77, but the club may feel this is undesirable from a wider perspective. If the firm sets a price of P1, but there is an unexpected increase in demand to D2, then it will lead to a shortage (Q3-Q1). For example, in 2019, the makers of the ‘Impossible burger’ (a vegetarian burger which takes like beefburger) have been struggling to keep up with demand. Raising price is not desirable as it may create adverse publicity. Alternatively, a toy manufacturer may release a game at a set price of £70, but if it there is a ‘craze’ for the toy, then demand will outstrip supply – and it can take time to respond to the increased demand. 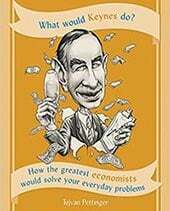 If there is a shortage of a particular good, there are many potential outcomes. Queuing /waiting lists. When there is a shortage of goods, it will encourage consumers to queue and try and get the limited goods on sale. The worse the shortage, then the longer the queues will be. 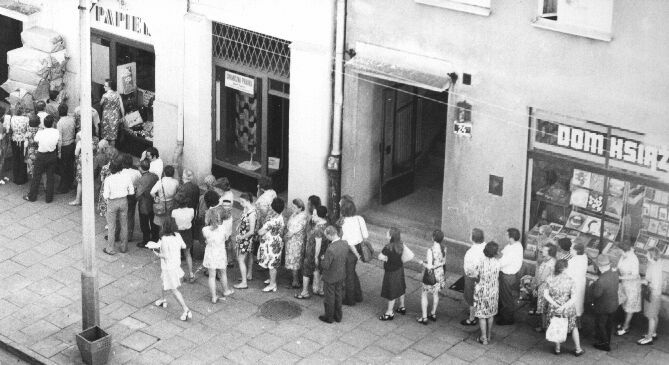 Queues are an inefficient use of time as people who spend time in a queue could be doing something more useful. Increase in demand for substitute goods. If bread is in short supply, consumers may try to get alternative goods, such as rice. If there is a shortage of just bread – it is easy to switch to other foods. However, if there is a general shortage of food – there is no alternative. For many goods, there is no perfect substitute. For example, a Manchester United supporter who can’t get a ticket to see his team is unlikely to want to spend his Saturday afternoon watching Bury – even thought tickets are available. Make use of income to buy any good. In extreme cases of widespread shortages, consumers may buy goods that they don’t even need. They feel it is better to make use of their income and buy goods – that hopefully, they will be able to sell or barter in the future. Black market. A shortage implies that some people would be willing to pay above the current market price. This can encourage people who were able to buy at an artificially low price to resell at a higher price. 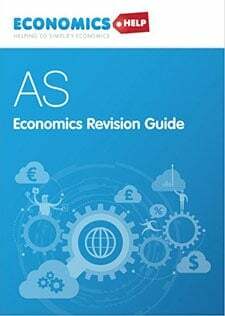 If the number of goods on the black market is limited, then black market traders can take advantage of inelastic demand from rich consumers to charge well above the market price. This can be seen in ticket touts who sell highly sought after tickets at very high prices. Deadweight welfare loss. 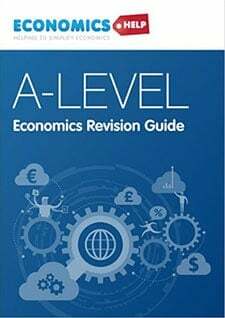 A shortage implies a deadweight welfare loss (net loss of economic welfare to society) For example, a monopoly who limits supply to maximise profits, limits the number of people who can enjoy the good. Decisions on supply were made by the Central Committee. It could be difficult and time-consuming to get these decisions changed. Even if the decision was made to supply more, it could take a long time to actually increase the supply of the good. Lack of incentives. In a command economy, there were not the same incentives to respond to shortages. Firms couldn’t increase price and/or increase supply. 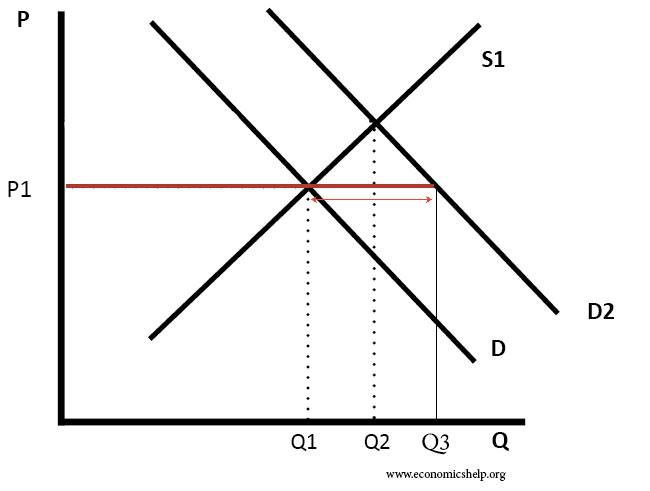 The government often set artificially low prices to make goods appear more affordable. 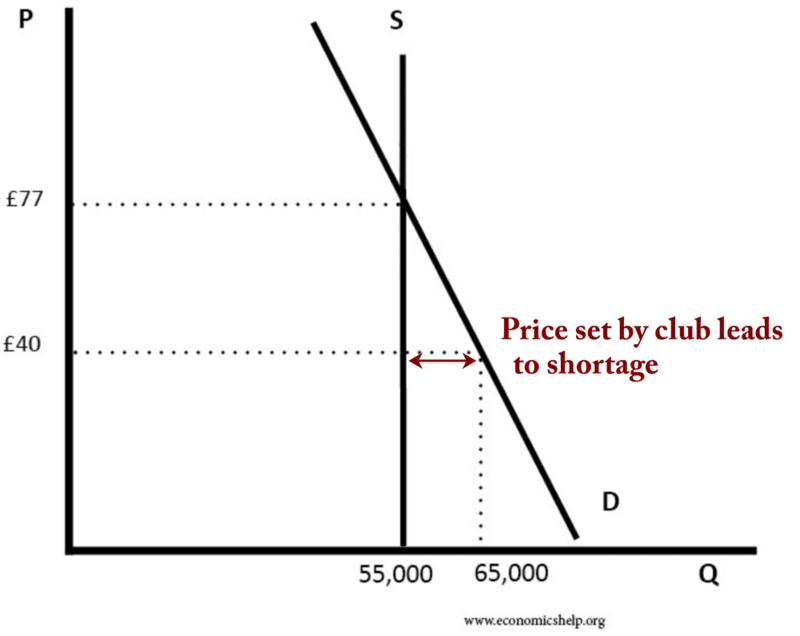 In a free market, the price mechanism will respond to the shortage by putting up prices. 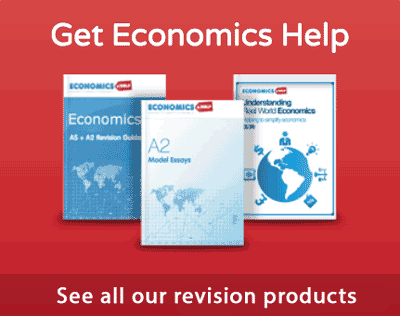 Firms have an incentive to increase the price as they can increase profits. As prices rise, there is a movement along the demand curve and less is demanded. The higher price also acts as an incentive for suppliers to increase supply. The price will rise until there is an equilibrium price of P1.